I recently finished up another battalion of Canadians for the Vimy Project. This is the 52nd (Northern Ontario) Battalion CEF – part of the 9th Brigade, 3rd Division. 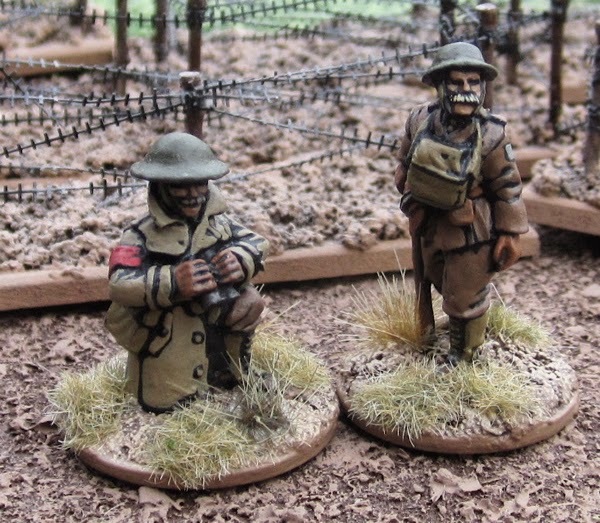 These figures, as with all the figures in the 9th Brigade, are from Brigade Games. Detail of the battle patches. The chap on the right is from Brigade Games and will become part of either the 9th Brigade staff or the 3rd Division staff. The other one is from Great War Miniatures and will likewise be part of either the 7th Brigade staff or the 3rd Division staff. I'd like to get playing some miniature games this week - hopefully Galleys and Galleons and some Song of Blades and Heroes. These are “Fish Men” from Black Tree Design that I’ll be using as Deep Ones in any sort of Cthulhu campaign that requires them – hopefully starting with Cthulhu Invictus (whenever I get that started!?). These ones actually took the longest. I started them in the fall and agonized over how to do the turtle shell shields. I'm still not happy with them... but it's time to say "enough" and just move on and do something else! These are Deep One Hybrids that I picked up recently from Brigade Games (though I think they might be manufactured by Rattrap Games…?). 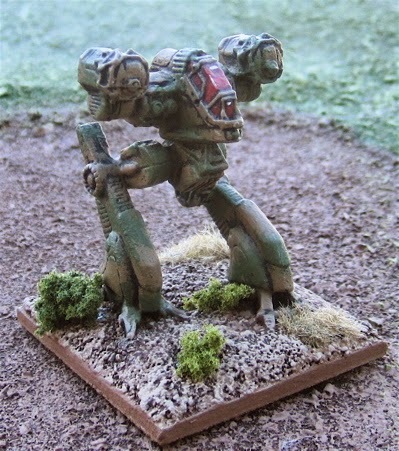 I also dug out some old Games Workshop Epic Eldar to have a crack at. 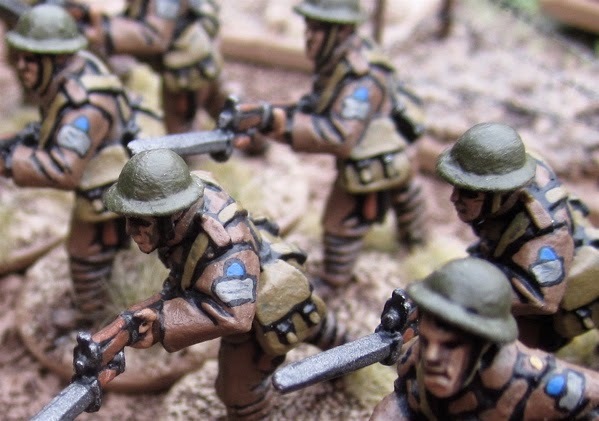 I have quite the assortment of stuff on the workbench at the moment… more Micro SF stuff… a Great War Canadian battalion… Deep Ones and Deep One Hybrids… hard to tell what will get finished first as none of them are really pressing. This past weekend was Freezerburn 2015. Freezerburn is an annual day of gaming that my friend John has been hosting for the last few years. There’s usually about 12 participants. Gaming starts at 8:30 in the morning and ends late in the evening. Everyone brings a game to put on the prize table then through the day everybody’s position in each game is tracked and points are awarded and whoever has the highest point total at the end of the day picks first from the prize table. I went to Freezerburn I back in 2011 (was it THAT long ago!?). I haven’t been able to make it to any of the other ones for one reason or another. I was really looking forward to going this year. I mean I was REEAAALLLY looking forward to going – especially because I’ve been playing a LOT more boardgames lately and the line up of games to be played looked super exciting! 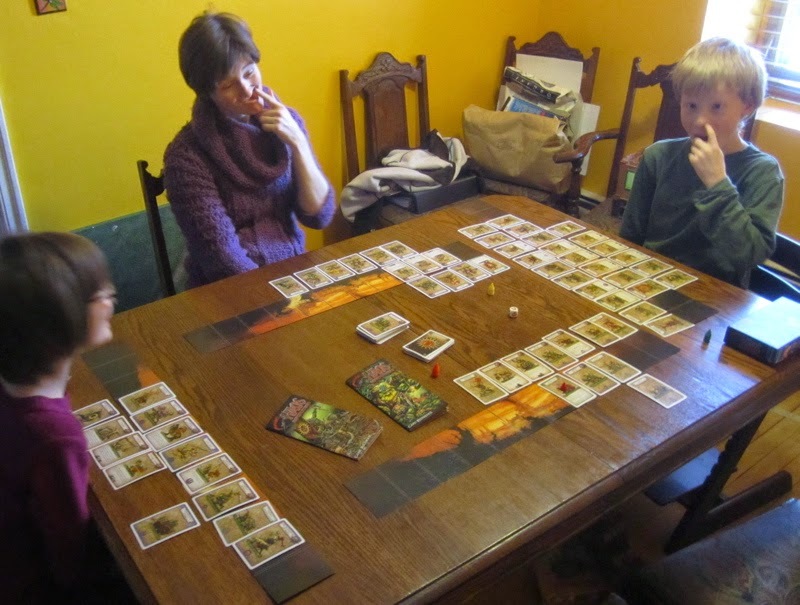 Packing up after a game of The Hobbit Card Game. On Tuesday my friend Gary stopped by with his homemade version of End Garde - which really lifted my spirits on a day when things were getting a bit gloomy. I’m out now and doing okay. Hopefully get back to some gamin’ and paintin’… actually I have a few things painted and ready for posting before I went in to the hospital – hopefully I’ll get those posted tomorrow! 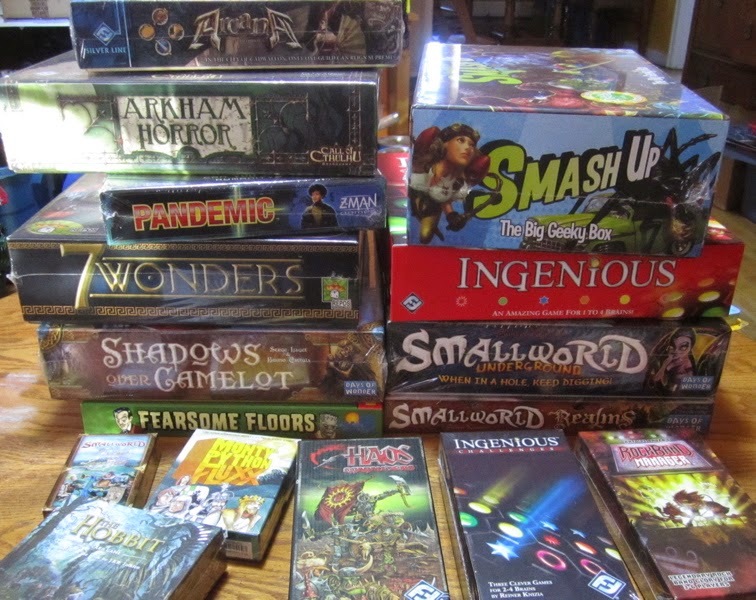 So here is what we’ve been playing over the last two weeks…. This is one that falls under the category of “played-it-lots-back-in-the-day-but-not-in-the-last-8-years” category. 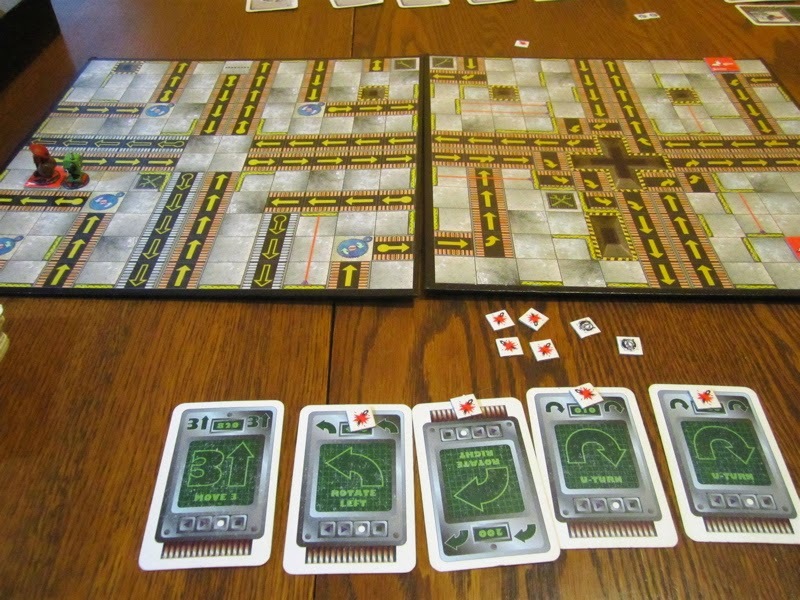 I played a LOT of Roborally back in the day. I don’t know how it got shelved and left for so long. 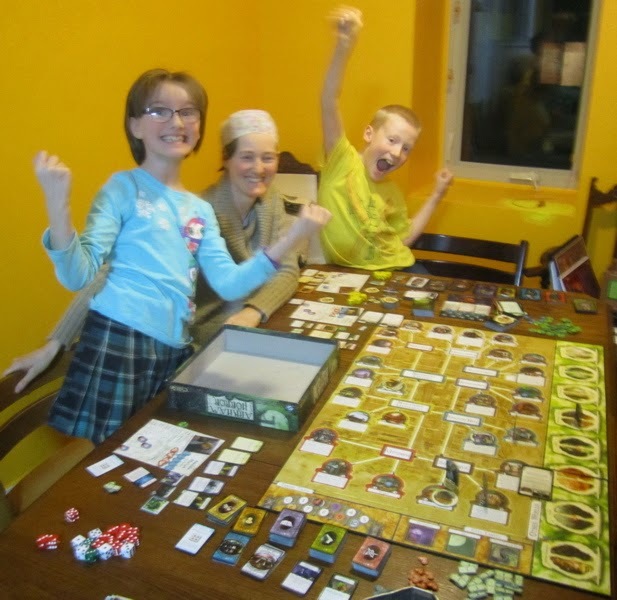 I was a bit worried that the kids wouldn’t catch on - but they totally did. 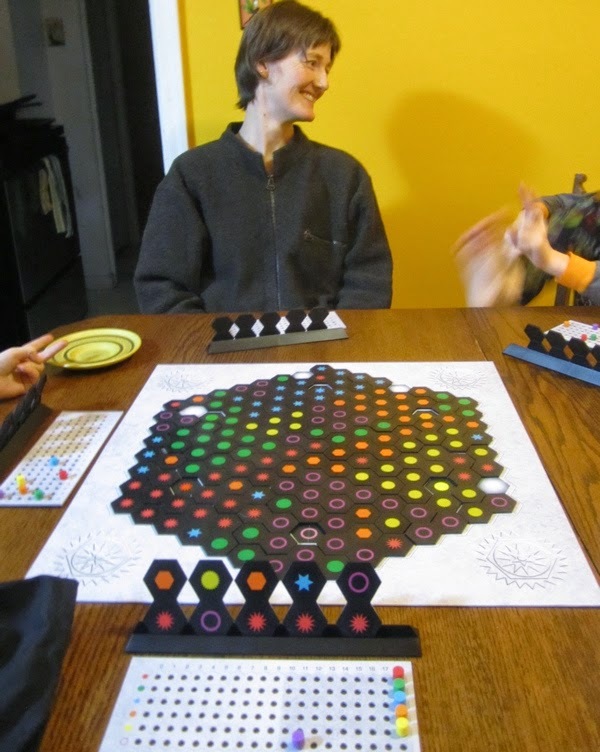 I was especially pleased when The Boy – after accidentally driving his robot off the edge of the board and having to start over again – just carried on. 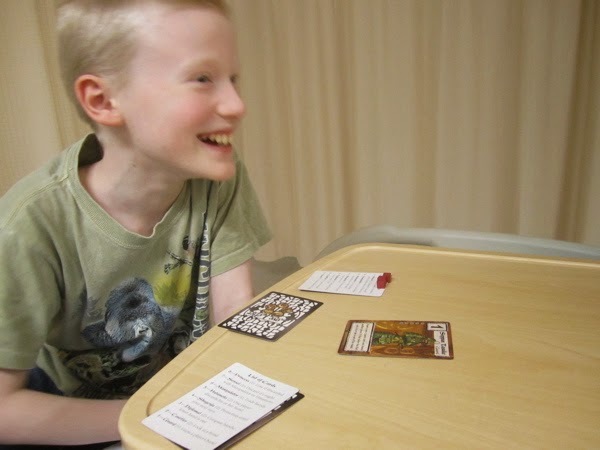 I’d half expected tears of rage and frustration – but apparently he had so much fun (even though he was dead last) that he hounded to play it again all week. 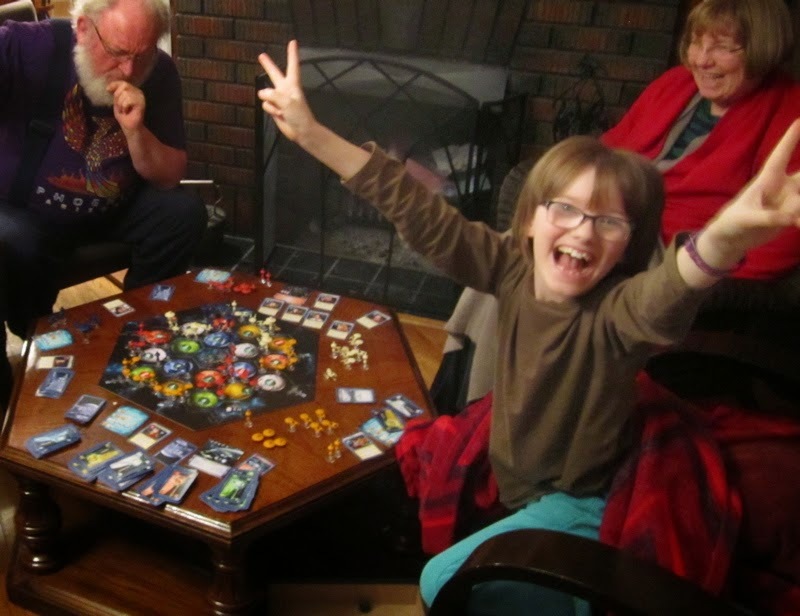 We played an EPIC - FOUR AND A HALF HOUR - game of Age of Mythology: The Board Game (Now that we know what's going on I really hope it take less time next time we play!). I'm going to go ahead and brag a bit here.... 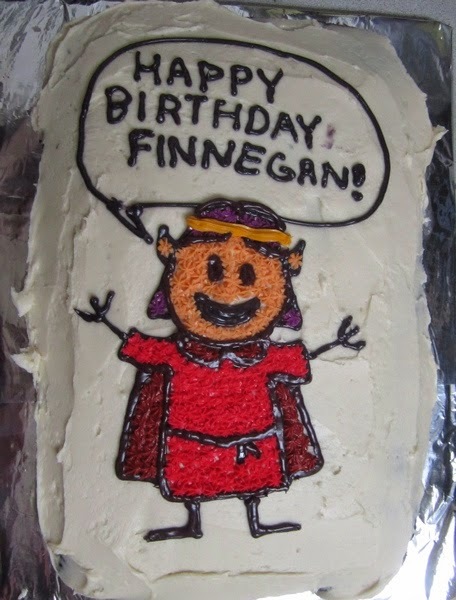 I have seriously awesome kids. 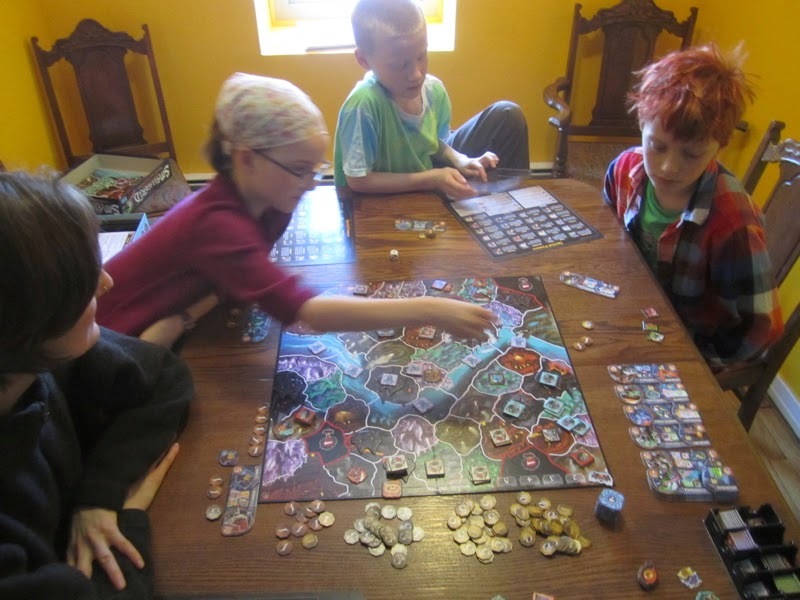 How many other 8-10 year olds can sit and play a board game for 4.5 hours and remain totally focused on the game for the whole time - paying attention to what others are doing on their turns, and planning their turns in advance!? 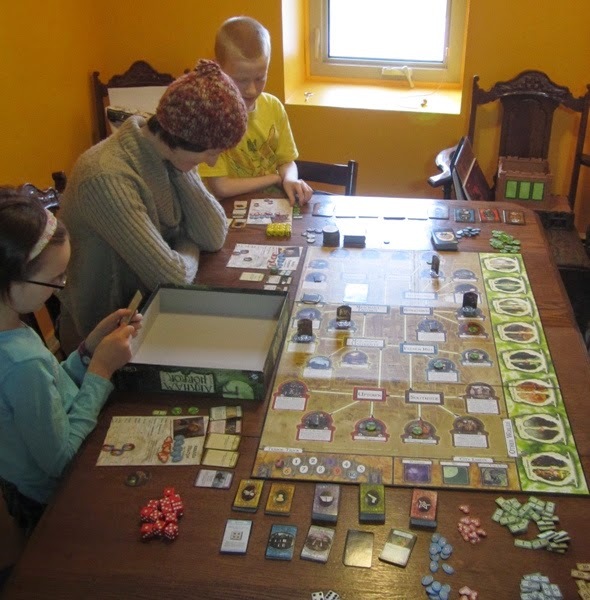 I was pleasantly surprised by the game - I had originally picked it up super cheap from distributor that was going out business and dumping all their stock on ebay. When I got it and had a look at it I didn't think too much of it - I it looked a little simplistic - but the kids were excited about it - likely because of all the little toys that come with it. 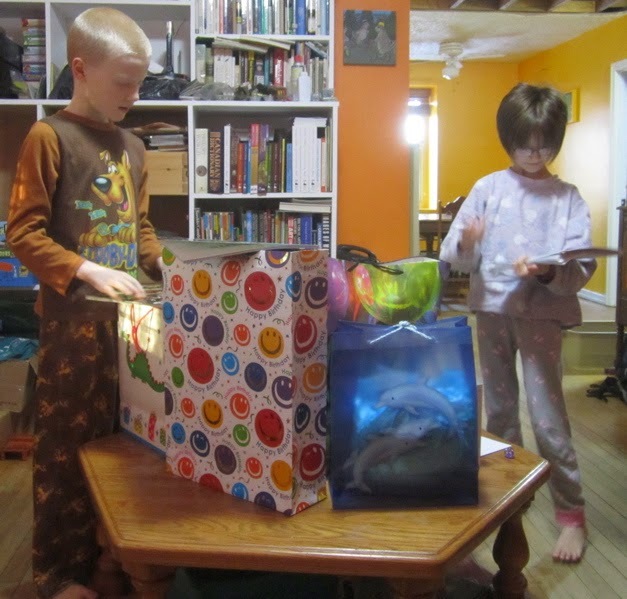 They've been bugging me about busting it open and trying it out for ages so I told them we'd try it out when they finished their school-y stuff for the year. 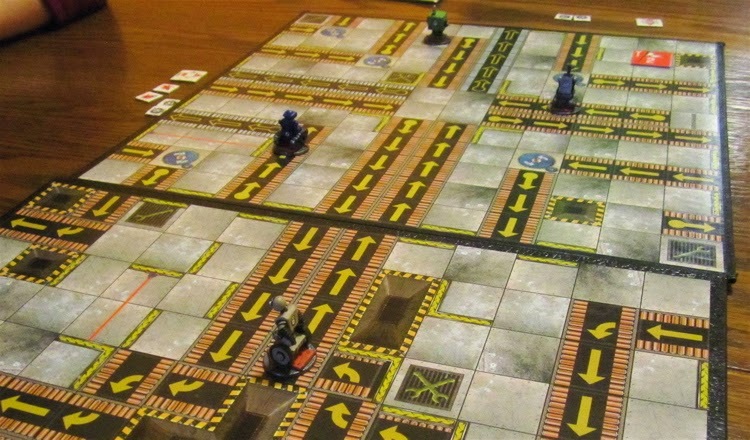 The first time we sat down to try and play it we ended up just spending two hours simply cutting all the little toys off the sprues and trying to wrap our heads around the rules. When we finally sat down to play it - it turned out to be far from simplistic, but instead there were a few different routes to victory and a number of different ways to go about either of them - I think the game really rewards having a good strategic plan from the get-go and sticking to it. The Boy won this first game with 10 victory points - I was just a hair behind with 9. The Girl only got 2 victory points - BUT - she was so very, VERY close to building The Wonder - which would have scored her another 8 - tying with Finnegan. 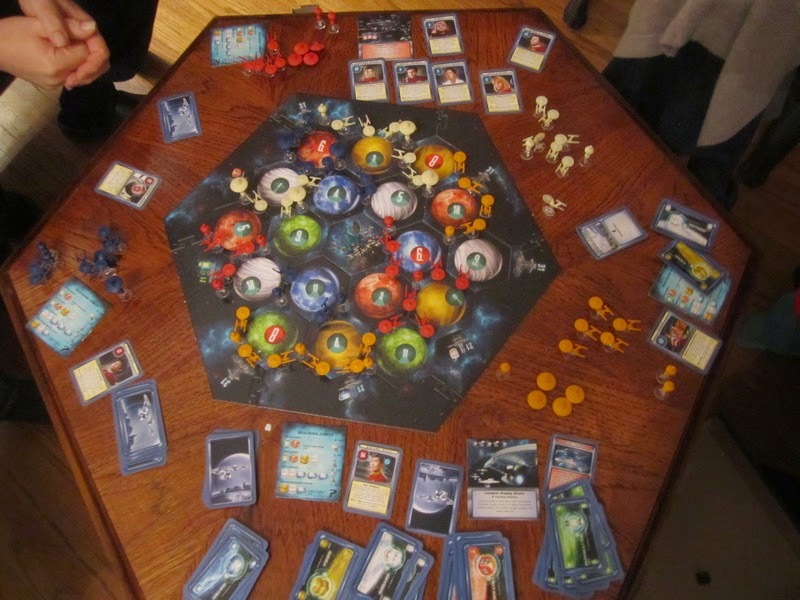 I'm curious to see how it turns out next time we play - now that we have a better idea of how the mechanics work. 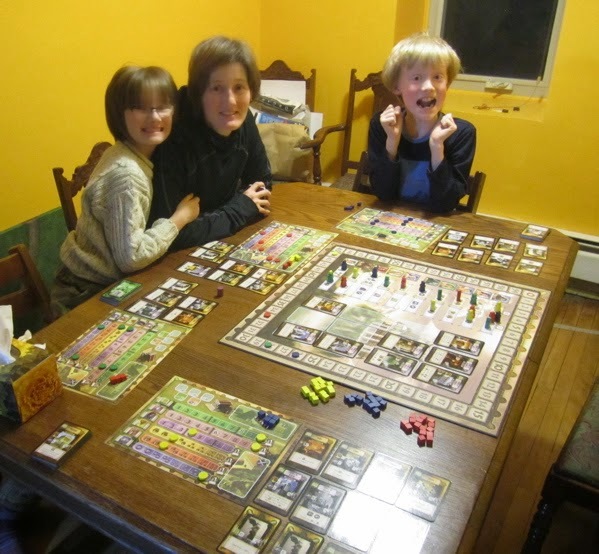 In the evening when Amanda got home we got her to play a game of Olympus with us. I’d played it the previous week with the kids and they had been telling her how much fin it was ever since so she was curious to have a go. 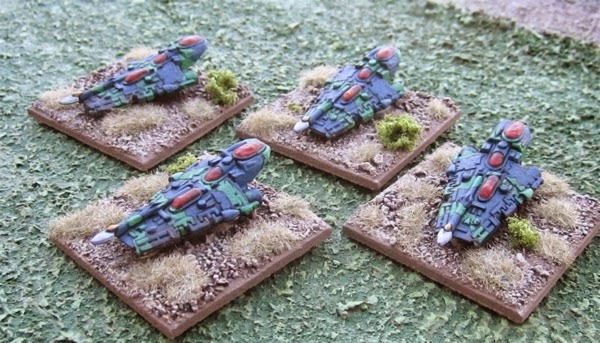 I got this one from the recent Fantasy Flight Games sale. 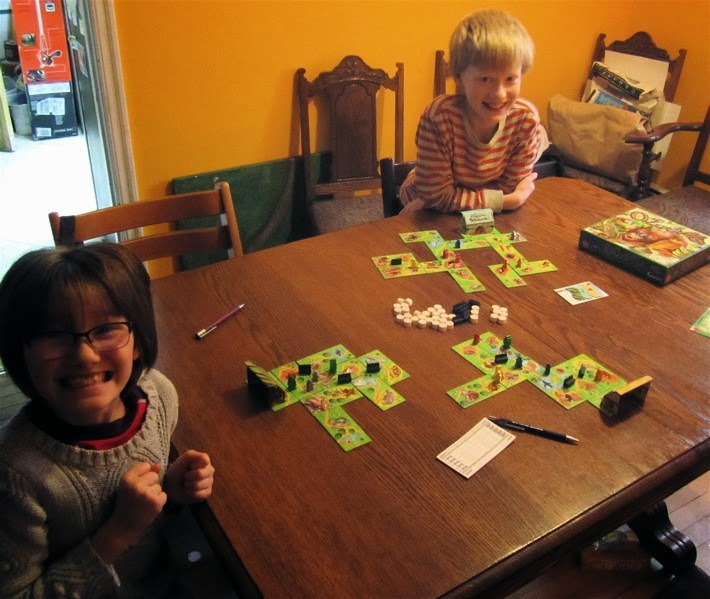 In the afternoon I played a game of O Zoo Le Mio with the kids. This, as with Age of Mythology above, was another of the games I originally picked it up super cheap from a distributor that was going out business and dumping all their stock on ebay a few years back. 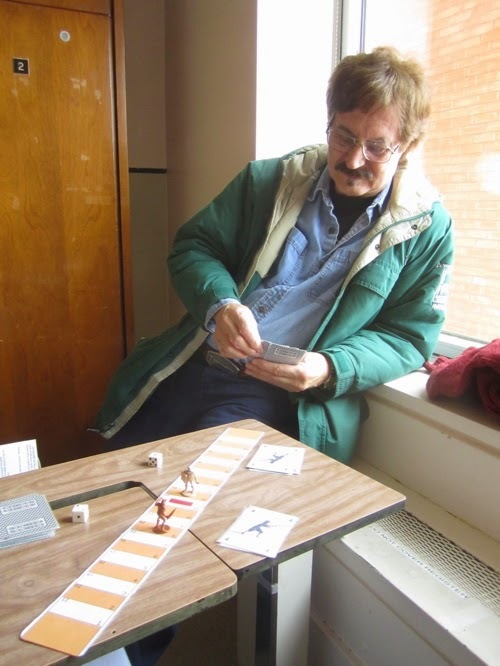 This is a clever little game where we played Zoo Directors trying to build the most impressive zoo to attract the most customers - involving bidding and tile laying. My folks got this one for The Boy. Amanda is gloating just a bit. It was rather infuriating because The Boy and I spent so much time figuring out where the monster would be heading on the next turn – but were always confounded by Amanda and The Girl’s inexplicable and random movements – they would almost every turn unwittingly draw the Monster’s attention and having it raging off in a completely different direction than we had foreseen. 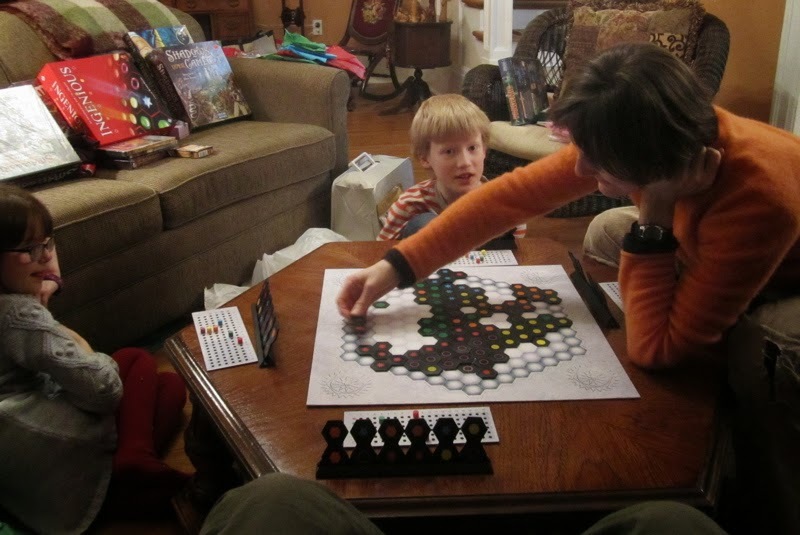 After that we broke out Ingenious (a game my folks got for me). 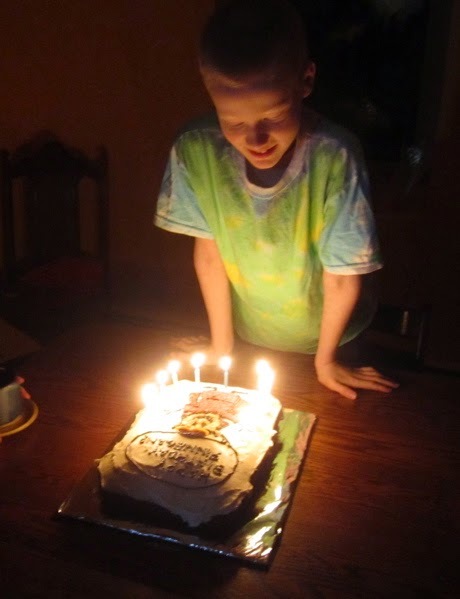 I think The Boy won this one…? it was very close! 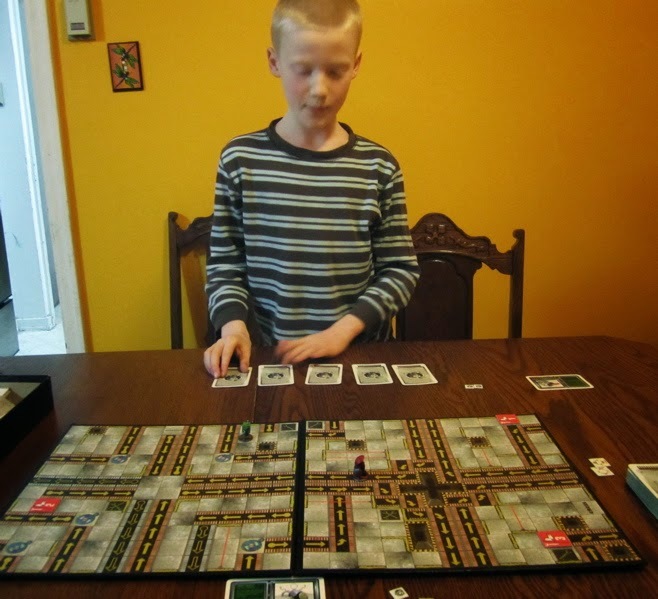 The Boy got this game in his stocking (another game I picked up at the FFG sale). Everyone’s doing their best Orc or Goblin impression. Amanda taking it rather well that she’d just lost ANOTHER battle line of her own sue to rolling the Mark of Chaos after completing it and attempting to attack someone else’s uncompleted battle line (1 in 6 chance). I think this was the third such line to be lost in this way. We were all laughing at the utter ridiculousness of it!? I think the box said it was supposed to be played in 30 minutes, but it took us about TWO HOURS!? 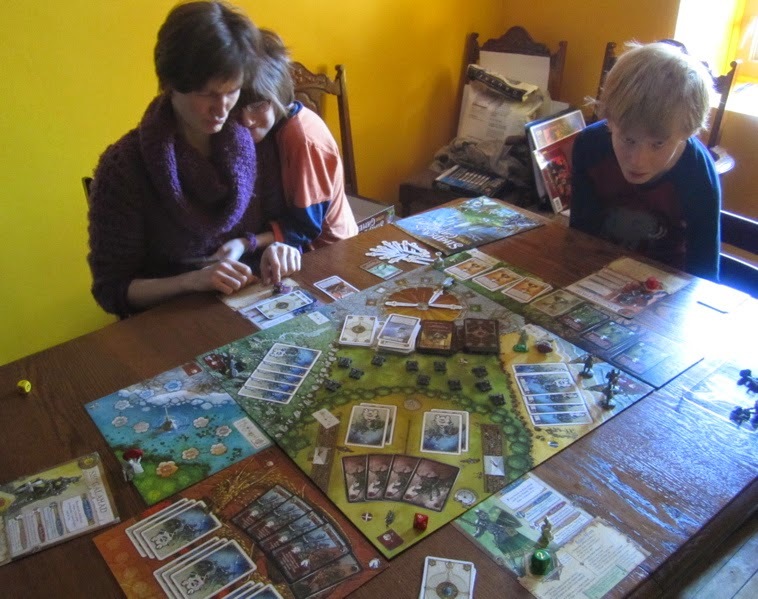 The Boy utterly defeated us scoring nearly as many points as the rest of us together! The kids and I rode over to the Dragon’s Den for their Boxing Day Sale! We arrived shortly after 10 when they opened but there was already people streaming out with piles of boxed games under their arms! When we got in the store it was like being in a Rubik’s Cube and there was a line to get to the till that warped around the store. One of the games I picked up on Boxing Day at the Dragon’s Den. 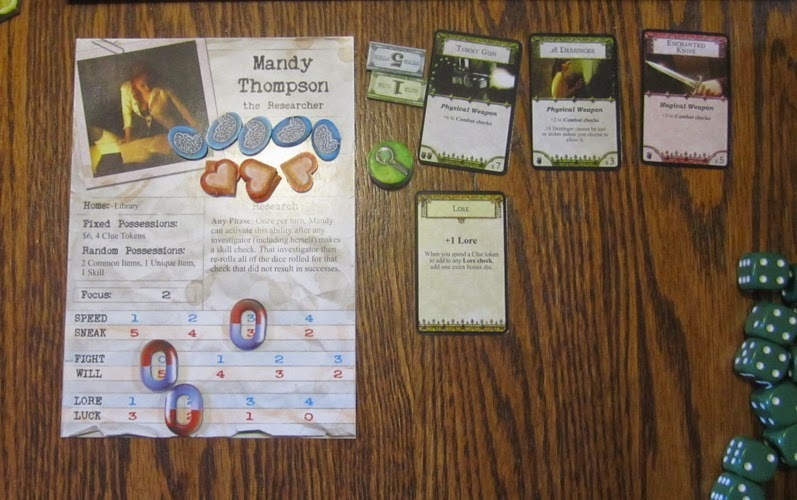 In the end it was The Boy who won the affections of the Princess (though it was a very close game – both the Girl and I were only one token away)! 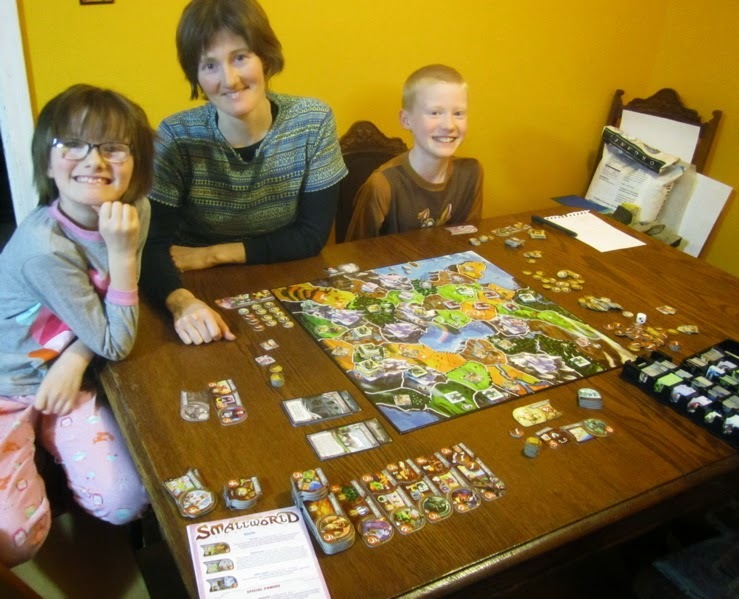 This afternoon we started off with Smash Up along with the Big Geeky Box that our friend “Other Tim” got us and the Science Fiction Double Feature expansion that The Girl picked up on Boxing Day. 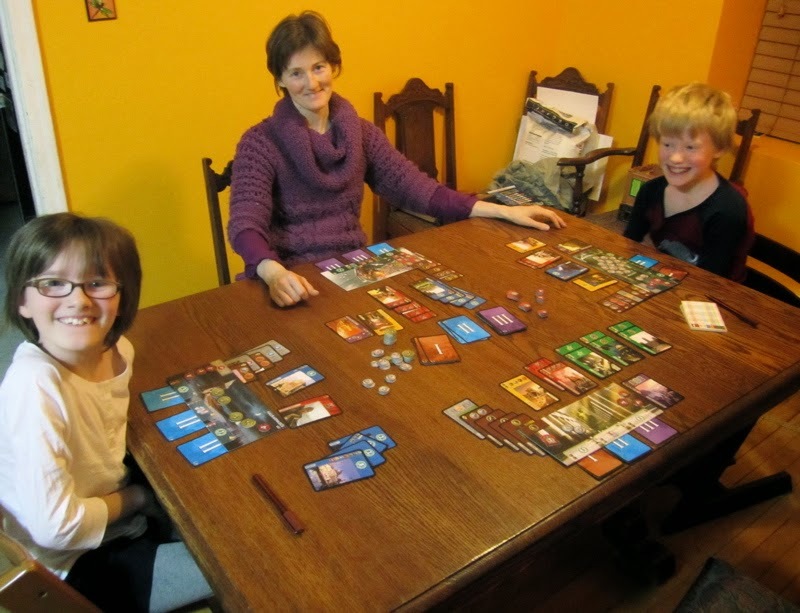 In the evening we played 7 Wonders - another gift for me from my folks. Amanda - the Military Dictator of Rhodes - crushed us all - and yet, there were still smiles all around. I can see why this game is so popular. We finally busted out Arkham Horror. We didn’t really get started until after supper (a late supper at that!) 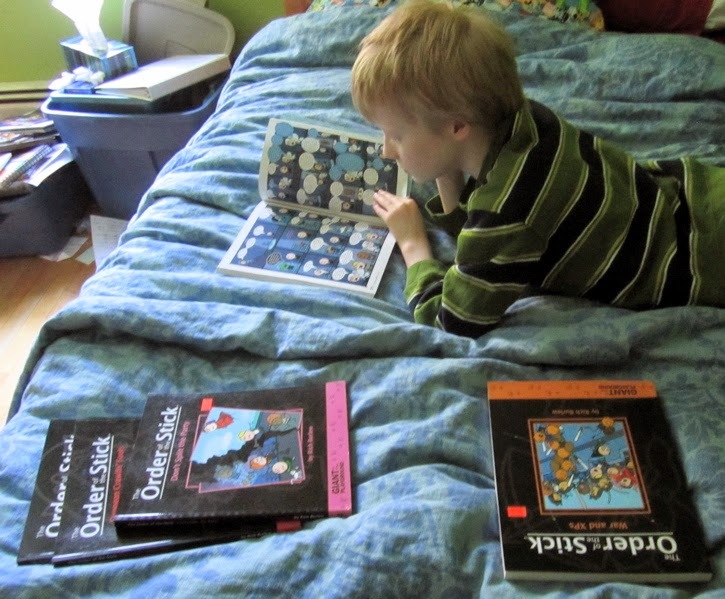 and by the time we had gone through the rules (mostly) it was already well past the kids regular bed time. 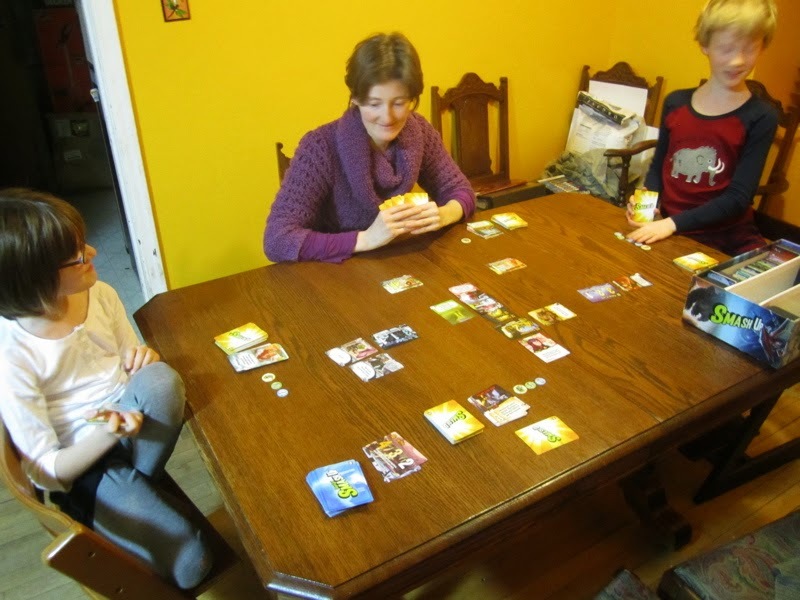 We played a few rounds just to see how it plays (so hopefully we’d REMEMBER some of the rules the next time we had a chance to sit down and play it) – though we didn’t finish I’m still counting it as a play! Amanda’s gift from my folks. 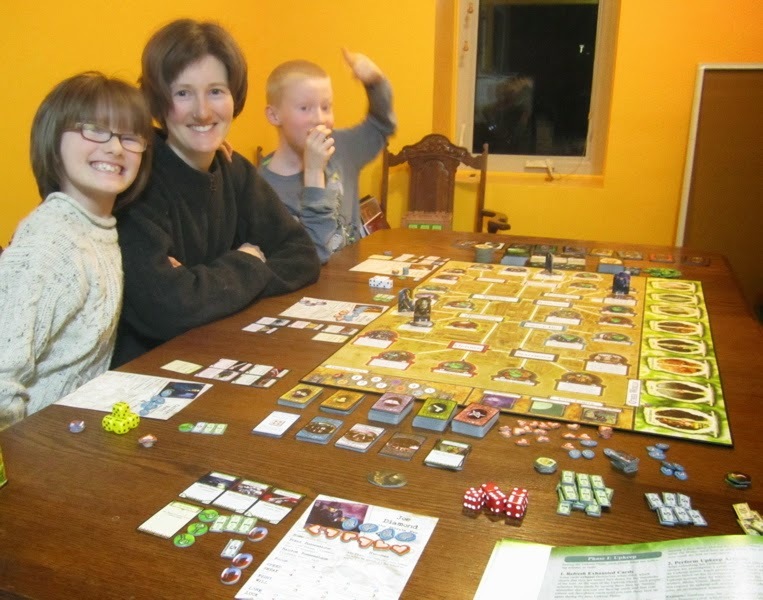 I had The Researcher, Keria had The Scientist, Amanda was the Quarantine Specialist, and Finnegan played the Contingency Planner. Things started off looking not great with three blue cubes on both New York and San Fransico, and two on Washington. 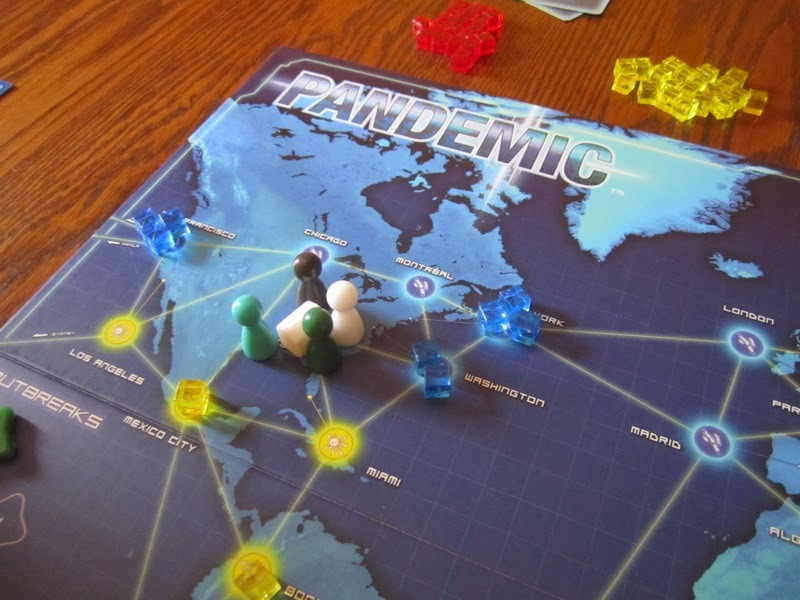 As it turned out it was pretty easy to deal with (us all starting in Atlanta and all) and by the third or fourth turn Blue was eradicated (Woo-Hoo!). 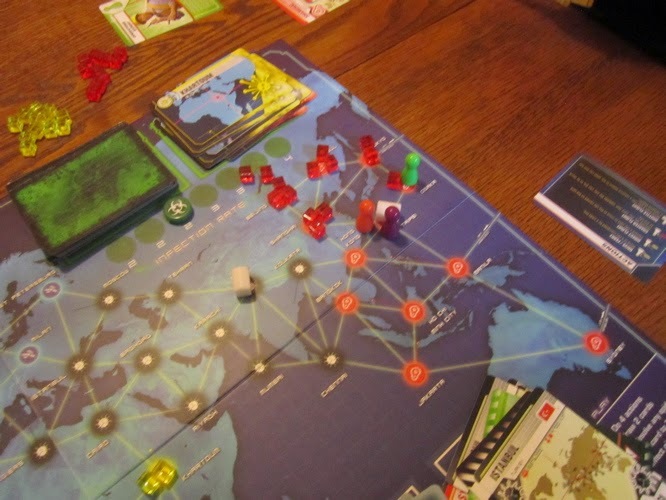 We were one player turn away from curing red and a second player turn from eradicating it when I drew TWO yellow on cities where there was three starting a chain reaction of outbreaks which lost us the game (due to running out of yellow markers). The kids took the loss pretty hard. 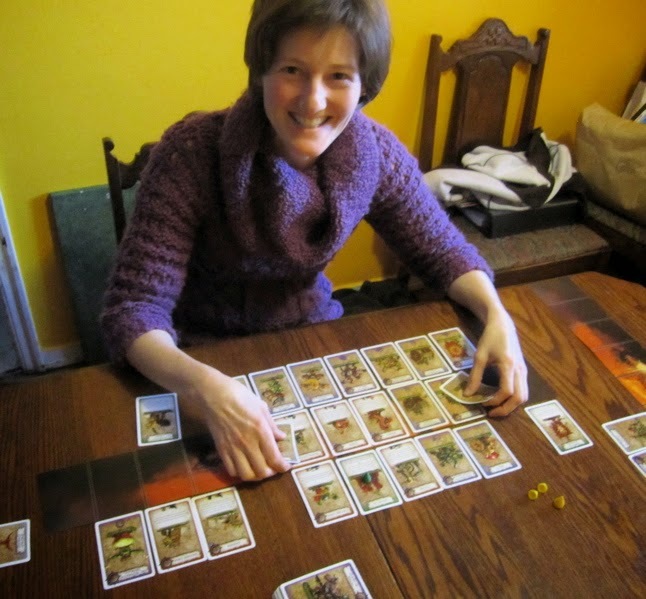 Amanda and I thought it was a LOT of fun – fast playing – a real nail-biter! 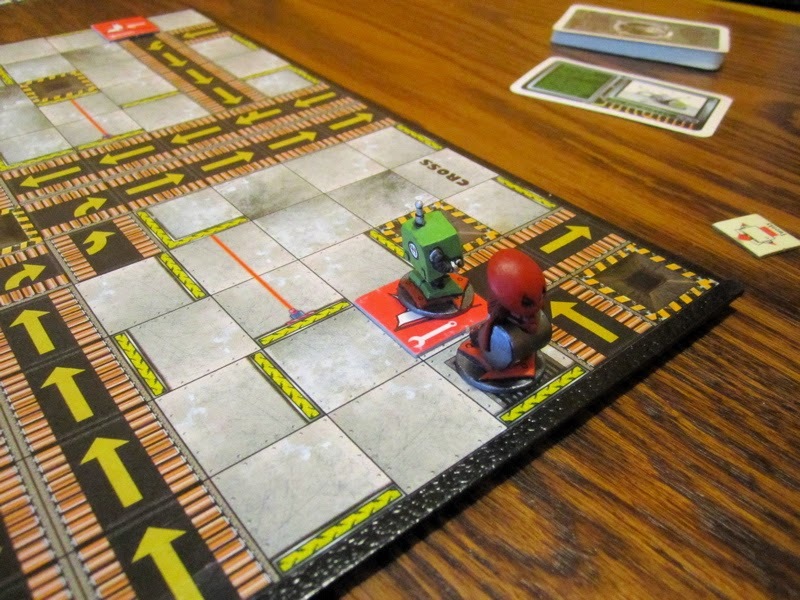 The Boy finally hounded me enough so I broke out Roborally again. 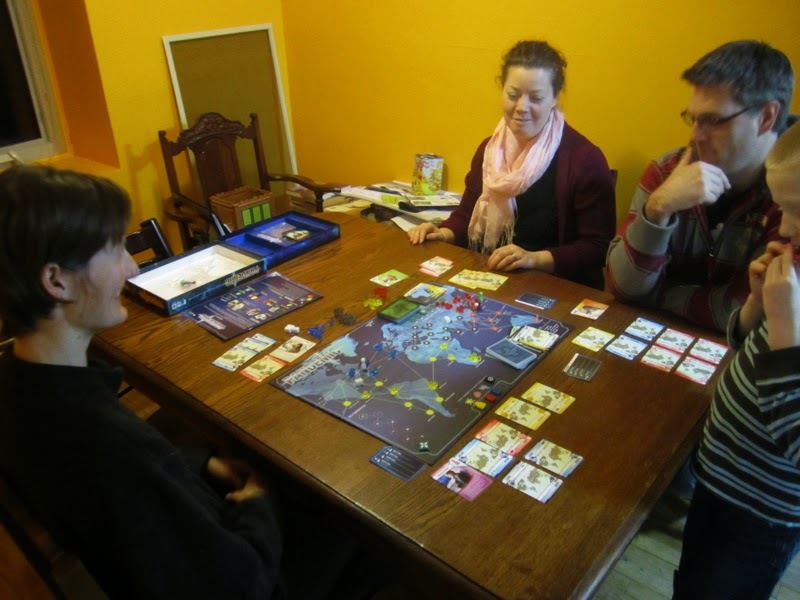 Some of Amanda’s friends were over in the evening and she roped them into playing another game of pandemic. So close that Amanda was so determined to beat the game she tried to convince me and the kids to try a third game of it after they left. 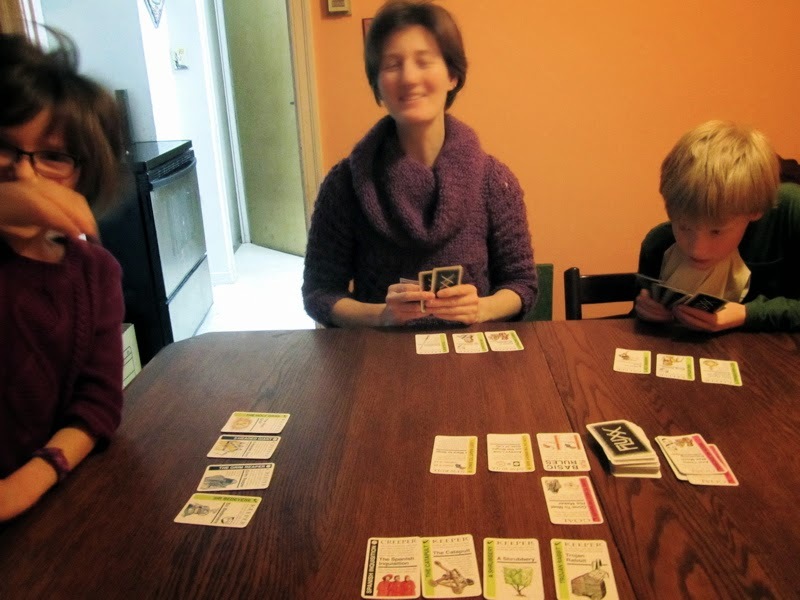 Instead we ended up playing Ingenious again. 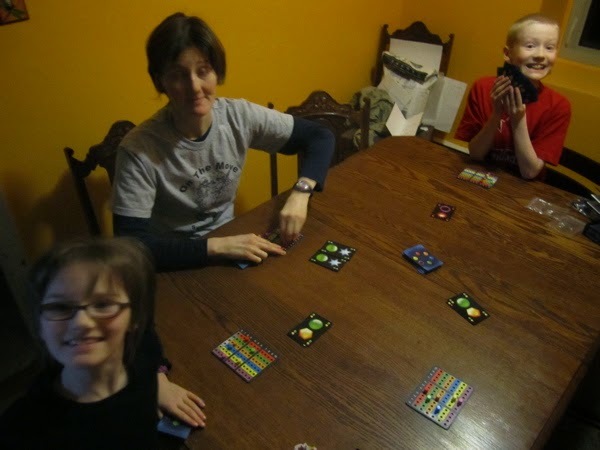 Super high-scoring, super close game – but despite scoring 18 in all colours but one… I was still dead last!? 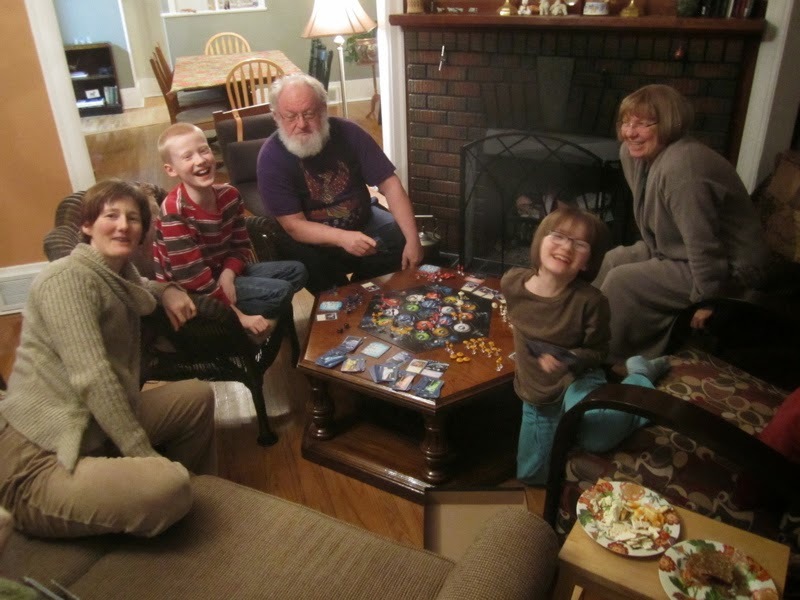 We bought a copy of Star Trek Catan for my Dad for Xmas. 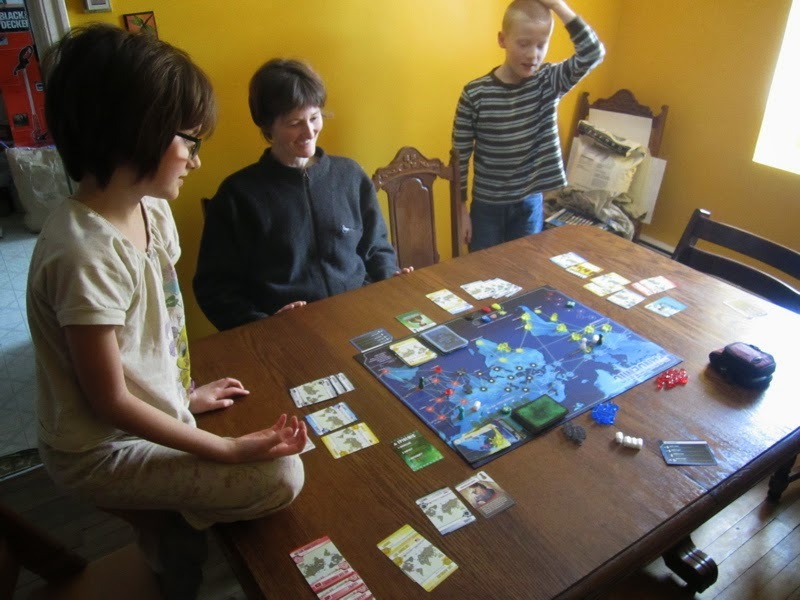 The kids go over there often so we thought we’d buy it so there’d be a game they could play with my Dad from time to time. 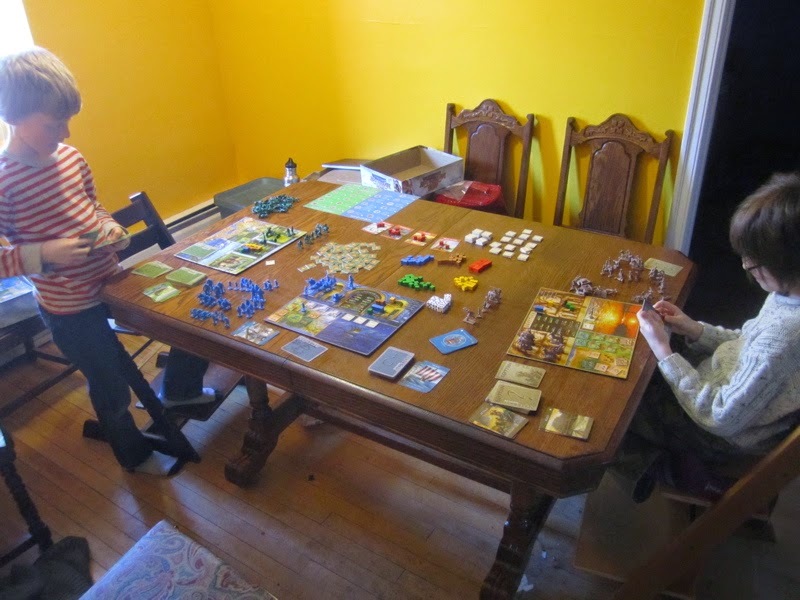 I have to admit I had never played any of the Catan games – none of us had had ever played any of the Catan games (oh, except Kids of Catan - but that doesn’t really count). 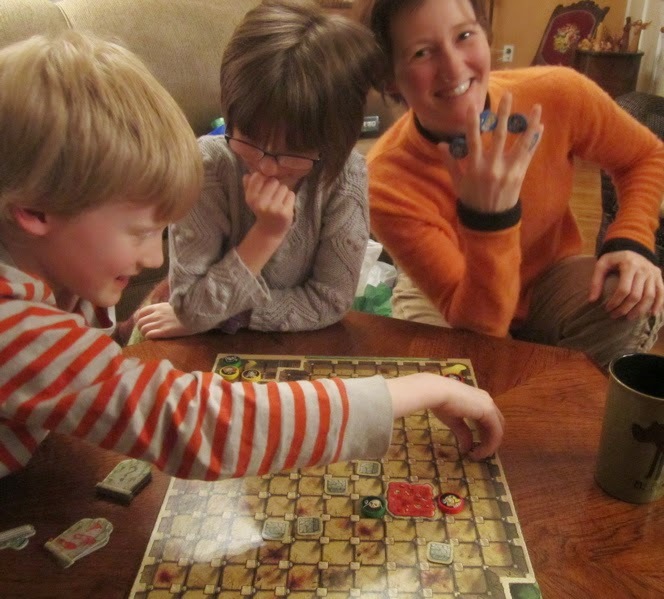 The game took us a lot longer than the 75 minutes it says it’s supposed to take on the box… it was closer to 3.5 hours! The Girl - pretty excited about her victory. The Game fest raged on into the new year. 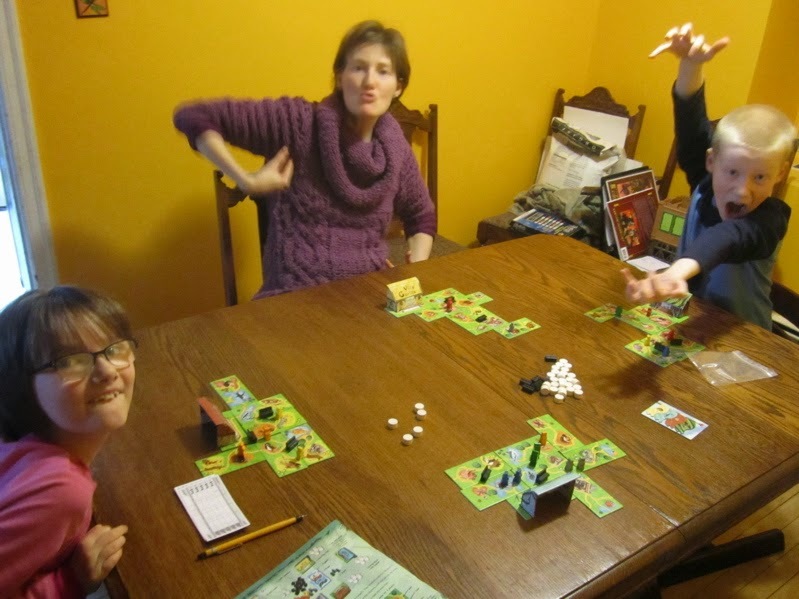 We kicked off the New year with a game of Small World. 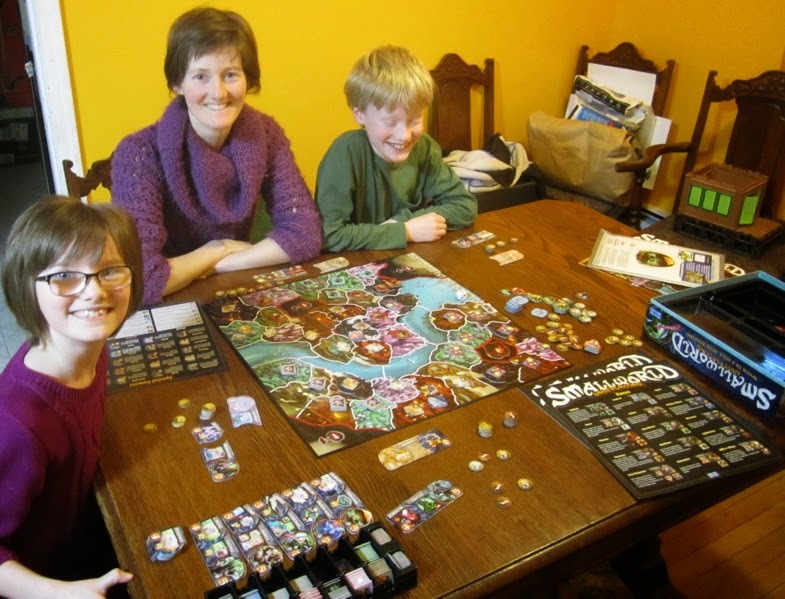 We have played a LOT of Small World since we picked it up last spring – what was new was the Spider’s Web expansion that I picked up on Boxing Day and the Tales and Legends deck that my Folks got for me. The Spider’s Web stuff was so-so, but the Tales and Legends Deck added an interesting element to the game. I don’t know that we’ll ALWAYS play with it… but I would definitely like to play with it more. Game #1 - Keira played Smaug - Good Guys won. Game #2 - I played Smaug - I rained down death and destruction across Middle Earth killing all in my path! MWA-HA-HA-Ha-Ha- ha-ha-haaaaaa...! (I won). 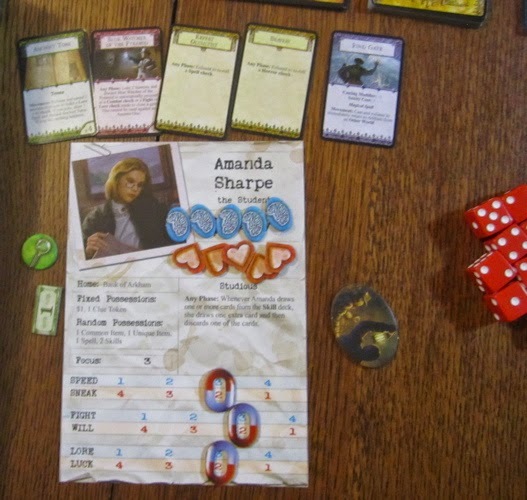 Game #3 - Amanda played Smaug - Good Guys won. 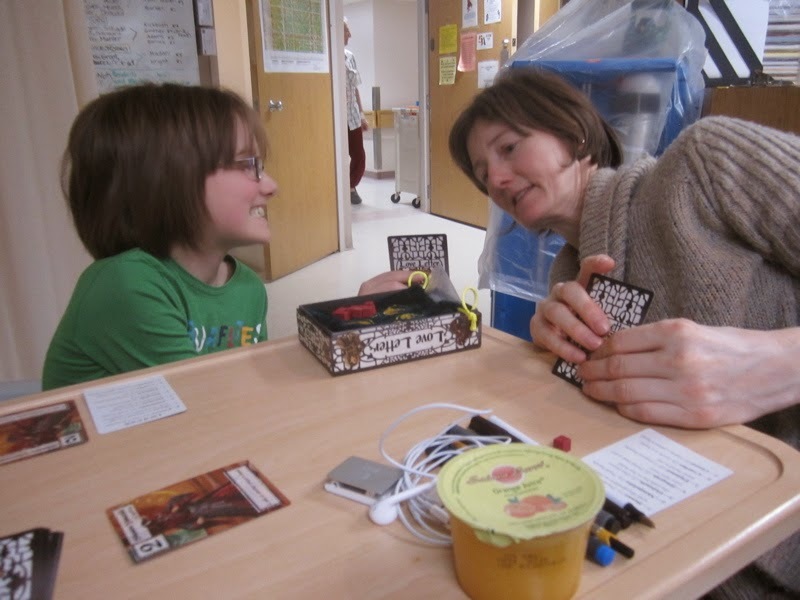 Well… the card game part (there’s three different games in that tiny little box!? This time we played a full game to the finish. It took us four hours – but we actually WON!? I think it was more blind, dumb luck that skill or mastery of the game. 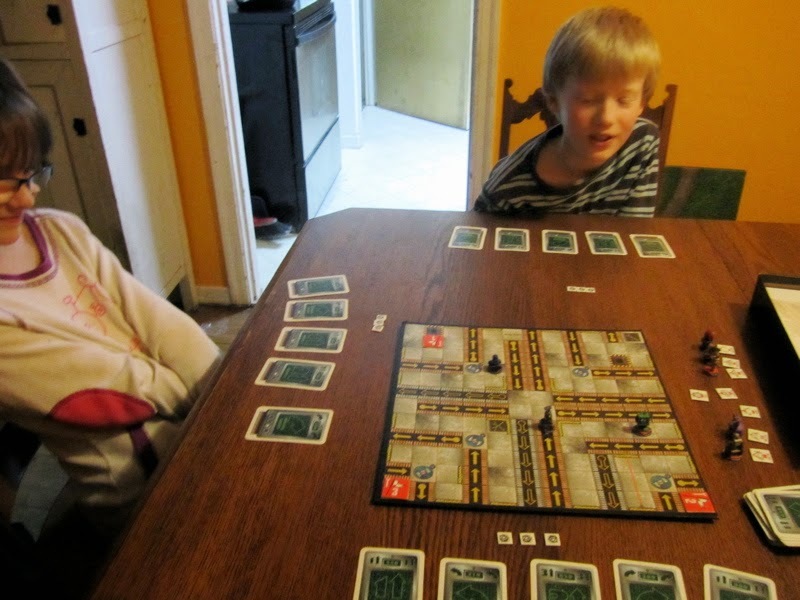 We did in the early part of the game – perhaps in the first six turns or so – manage to seal three gates. Foe many of the following turns when we drew Mythos cards we kept drawing THOSE same locations – so instead of a new gate opening up or another monster surge… nothing happened… We also had a lot of mythos cards that took monsters away… as we neared the end we found ourselves on a few turns wondering what to do – there were no monsters to chase down… and maybe one gate open – but we didn’t have clue tokens to seal it and there were none on the board. It was long and pretty fun. I could see it really going badly if one WEREN’T so lucky with the cards. I could also see this being a LOT harder with fewer players. 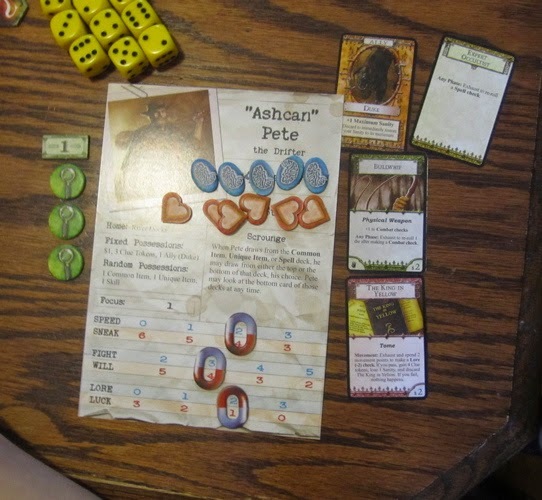 Unlike Pandemic where new bad cards are drawn EVERY Player turn, with Arkham Horror Mythos cards are drawn after everyone’s had a chance to do something. So if there are more players there are more opportunities to DO things before the next batch of badness arrives. Of course I could also see games with a lot of people taking a LONG time to play… maybe if you had a lot of people that all knew and loved the game it could go a bit quicker and people wouldn’t get bored along the way. I am definitely stoked to try it again – but it probably won’t be a “regular” simply because it potentially could take too long to play. 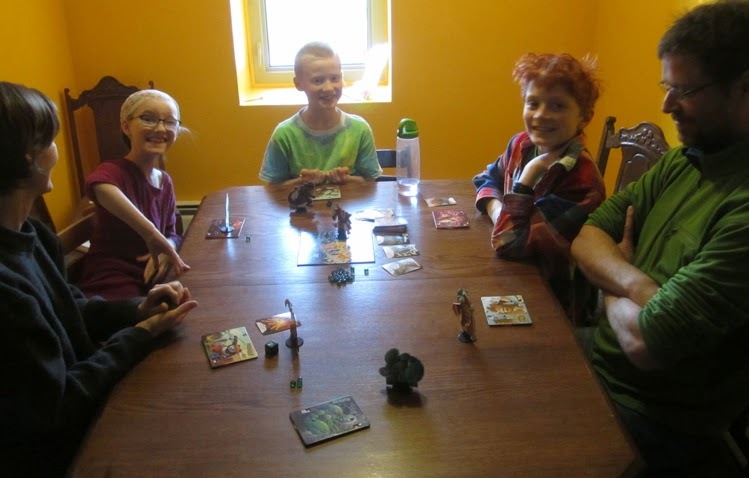 Because the trick taking element of The Hobbit Card Game reminded me of Kaiser – a game I played a LOT of back in the day… I decided to teach the kids how to play. 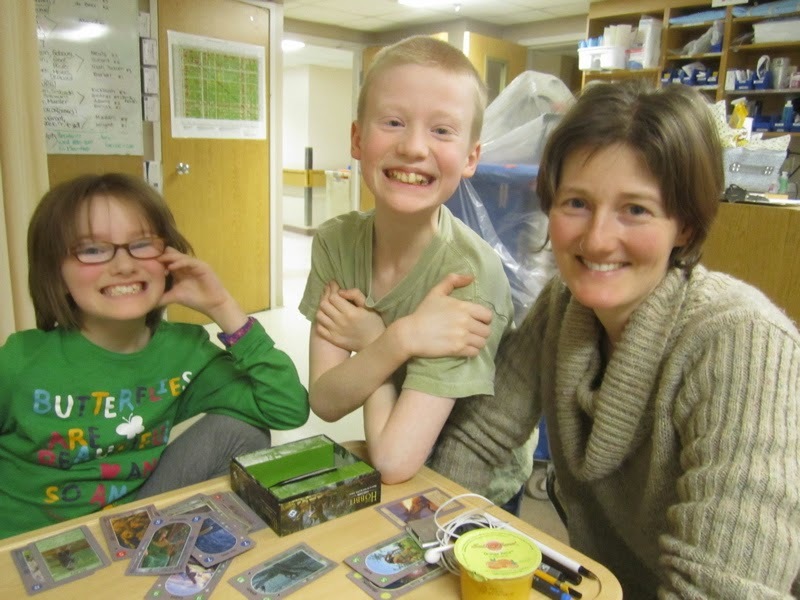 WE didn’t get to play a full game, but we played a few hands together (with open hands) and then played four rounds with Amanda – so they could get a sense of the game. 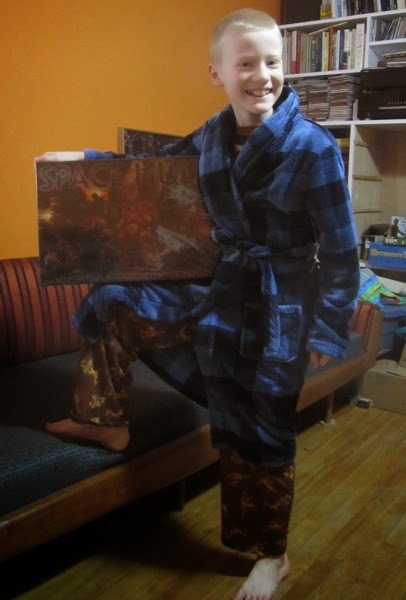 Among the presents was a suave new housecoat and a copy of Space Hulk (we did crack it open and have a look, but didn’t get to assembling the toys or playing the game… perhaps tomorrow…). We had also planned to head out to the Dragon’s Den - because he Nana got him a gift certificate – but we got up a little late and friends were coming after lunch and I hadn’t finished the cake(s) yet (and it was -41°C with the windchill!!! ), so we decided to go on Wednesday after our violin lesson (as the Den is not far from our instructors studio). 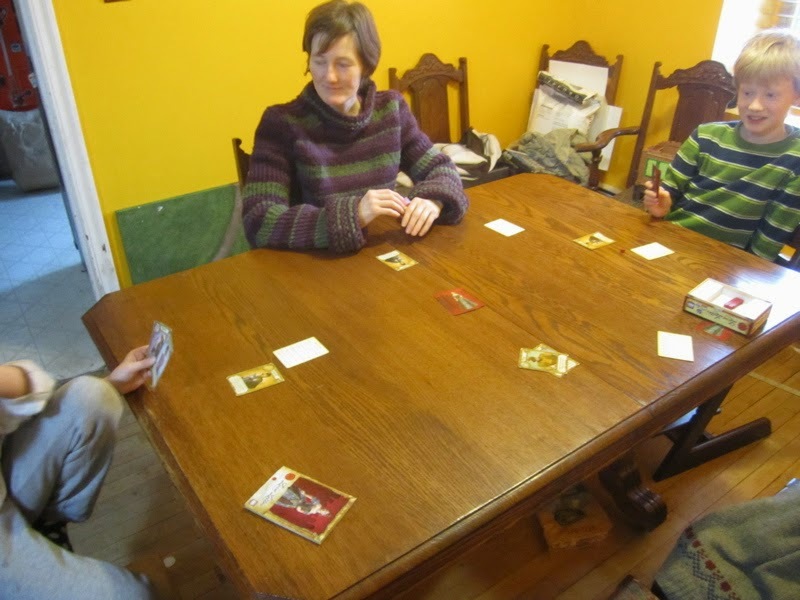 Then, after lunch, friends came by to start our DAY OF GAMING! I think this is the first time we tried playing with this many people - we had to use Tokyo Bay! 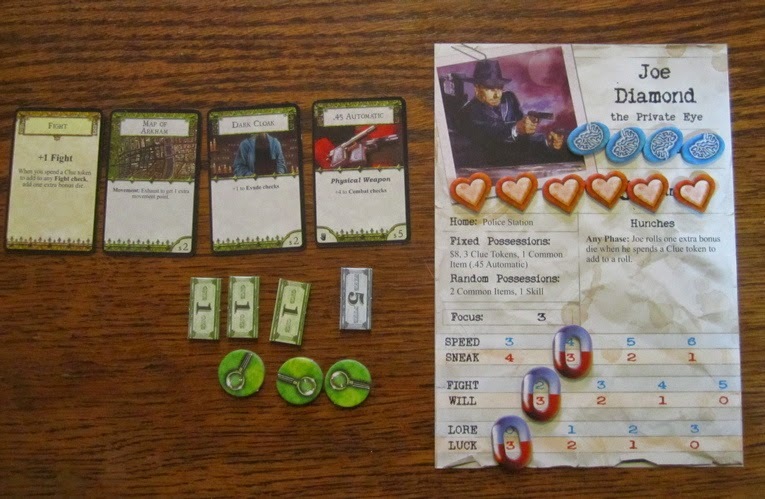 I tried to sit in Tokyo and just deal damage to everyone and win by eliminating them all, but stayed a little too long and ended up dying and getting kicked out of the game first (probably because I was playing the Kraken and not my traditional Cyber-Bunny…). 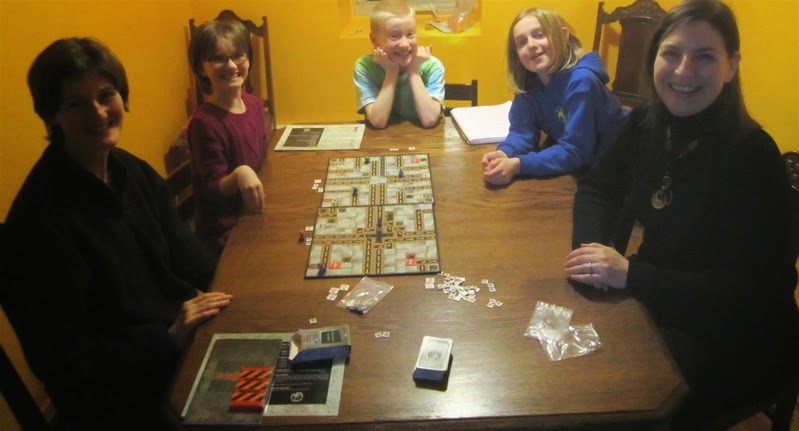 Other friends came over after supper to have some cake and ice cream - and play more games! 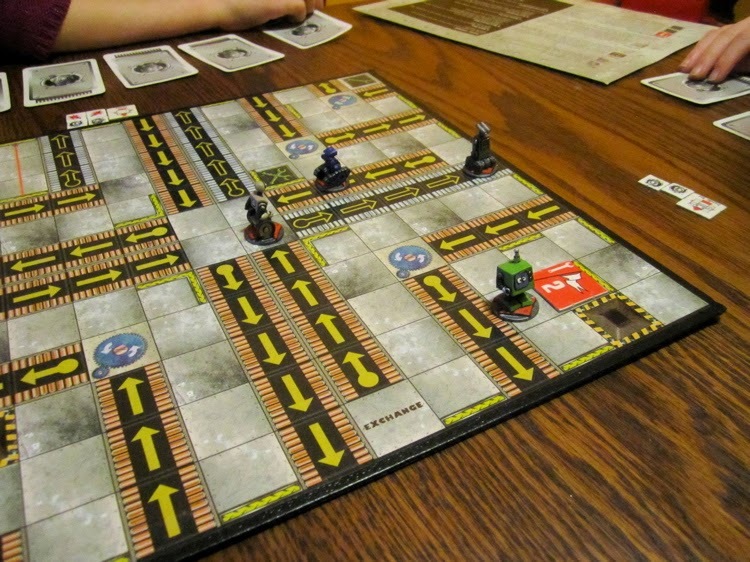 We had a pretty big, six-player game of Roborally – with two completely new-to-the-game players. It went well enough, but our friends had to leave around 8pm bfore the game was finished. But around the time we all finally got to the irst checkpoint it became evident that the kids were getting a bit tired and were having not-so-much fun so we decided to pack it in and call it a day. 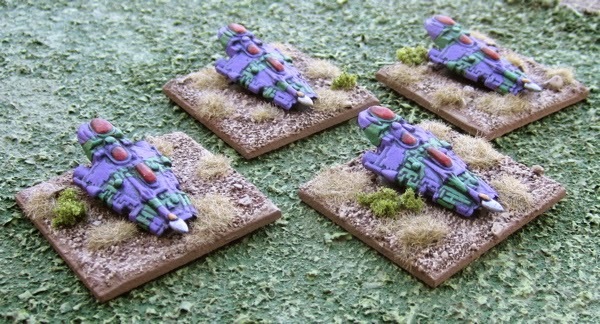 Get that second plastic faction done for Song of Shadows and Dust. PLAY some games of Song of Shadows and Dust (and Song of Blades and Heroes)!